Houston Texans at New England Patriots: Texans QB Brock Osweiler surprised a lot of people in a win over the Oakland Raiders a week ago. Osweiler was 14 of 25 for 168 yards with 1 TD and no INTs, he also ran for a score. The conservative, do not make mistakes mentality allowed the Texans to score just enough points to get the win in the wild card round. The Raiders were without their star QB Derek Carr and the Texans defense, which ranked 1st in total defense, shut down the Raiders offense. This week, Osweiler will have to continue to not turn the football over as he faces his toughest challenge yet, the red hot New England Patriots and their 8th ranked total defense. We expect the Texans to try and run the ball and keep Tom Brady off the field, but eventually Osweiler will have to hit some big plays downfield if the Texans want a chance for a massive upset. We think the key will be how the Texans defense will play against the league’s 4th ranked offense. They can rush the QB with Jadeveon Clowney and Whitney Mercilus off the edge, and if you can continue to harass Tom Brady you give your defense a chance to get stops. I believe it will be closer than people expect, as the Texans defense will keep them in the game but eventually the Patriots will force Osweiler into mistakes and too many 3rd and longs which will ultimately decide the game. The Texans inability to hit big plays on offense will wear the defense down as they will be on the field for too long and the Patriots should run away with it in the 4th quarter. Pittsburgh Steelers at Kansas City Chiefs: These are the two teams with the chance to upset the New England Patriots this postseason. This is the first time the Steelers have had a fully healthy “big three” in QB Ben Roethlisberger, RB Le’Veon Bell and WR Antonio Brown, so that will definitely be a major factor. The Dolphins could not stop Brown as he had 5 catches for 124 yards and two TDs in their win last week. We believe the Chiefs star CB Marcus Peters will do a much better job of limiting what Brown can do in the pass game, and force other WRs to beat them. The Chiefs defense has been susceptible this season, as they rank 24th in total defense, but they make up for it with a league leading +16 in turnover differential. The Chiefs defense forces you into mistakes and their offense does not make very many mistakes. The Chiefs are a completely different team with an emerging star in WR Tyreek Hill, who led the league in 60 plus yard TDs this year. He is explosive and a great complement to WR Jeremy Maclin and the All-Pro TE Travis Kelce over the middle. RB Spencer Ware has done a nice job filling in for the injured Jamaal Charles, and we believe the Chiefs will have great balance on offense. The biggest key to this game is QB Alex Smith, he has been called a game manger in the past but he has the ability to rip it downfield. The key will be his legs, which are vastly underrated. Smith runs the read-option and is far more athletic than people think, he can convert big third downs on the ground if the defense plays man across the board which will be a huge factor in sustaining drives. This game is a toss up, but I think that the Chiefs defense will get enough stops, force some turnovers and allow the offense to manage the game, while hitting a few big plays. The Chiefs should get the win with the help of their home-field advantage, but it will be a great game! Oakland Raiders at Houston Texans: If you love great offensive football, you probably should not watch this game. The Oakland Raiders already lost starting QB Derek Carr for the postseason, and may be without backup QB Matt McGloin as he injured his shoulder in week 17. That means rookie 3rd string QB Conner Cook will start if McGloin cannot play, and that is just not a story with a great ending. The Texans, however, have QB issues of their own as QB Brock Osweiler was benched earlier this year for his poor performance, and backup Tom Savage did not impress so Osweiler is now the starter again. Brock Osweiler is a big QB with a strong arm but he struggles under pressure and is mistake prone. The only thing we like about this move is that he has the arm to stretch the ball downfield to star WR DeAndre Hopkins. The Raiders defense has improved throughout the year but they were helped out a lot by a very explosive offense that could score points with Carr under center. The Raiders offense will struggle and the Texans defense will create turnovers to allow their offense to have short fields and that will be the reason that the Texans win a low scoring, defensive battle at home. 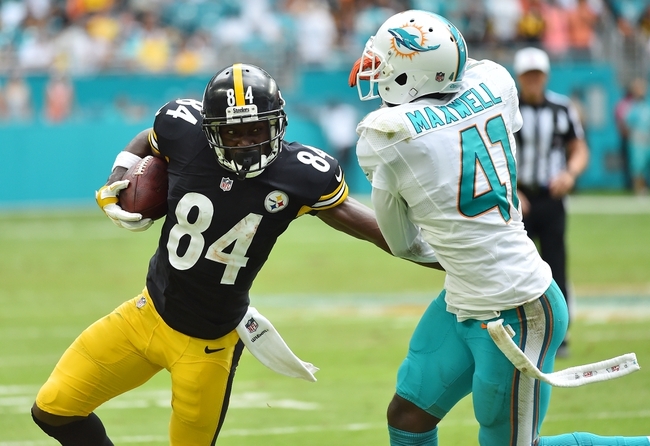 Miami Dolphins at Pittsburgh Steelers: The Dolphins defeated the Steelers 30-15 in Miami earlier this year, but Steelers QB Ben Roethlisberger was injured. This game has a very different feel to it, as all of the Steelers offensive weapons are healthy. Roethlisberger, RB Le’Veon Bell and star WR Antonio Brown will all be ready to play. The Dolphins will most likely start backup QB Matt Moore as Ryan Tannehill has not practiced this week. That is a huge advantage to the Steelers despite their defense being susceptible throughout most of the year. The Dolphins must run the football with Jay Ajayi and do their best to keep the Steelers offense off the field. We think the Dolphins can score and keep it close early, but their downfall will be Matt Moore’s inability to hit big plays when they matter most and the Steelers offense exposing the Dolphins defense that ranks 29th in total defense. The Steelers and their explosive offense will eventually run away with the game as the Dolphins will struggle to keep up offensively and their defense will not be able to stop Roethlisberger and company and the Steelers will get the win at home. Enjoy! Baltimore Ravens: The Ravens had a very disappointing 2015 season, as they were supposed to contend for the AFC North but fell to a 5-11 record. The fall was mostly because of injuries to QB Joe Flacco and other key players like WR Steve Smith. The offensive line was very ineffective and they could not protect whoever the QB was. They finished 26th in rushing and only averaged 267 passing yards a game. The Ravens addressed the OL in the draft by selecting OT Ronnie Stanley from ND, who specializes in run blocking so he will immediately help the run game. The AFC North is defined by cold-weather games where one team must win in the trenches to win the division, if the Ravens improve their OL play and can keep one of the best QBs in the game upright and healthy, then they should get back into contention for the AFC North in 2016. Cleveland Browns: The Cleveland Browns are one of the more intriguing teams to me this year. I watched the NFL Draft just waiting for the Browns to pull another “Browns move”, but it never happened. I think the new Browns’ regime actually knows how to build a franchise that could develop into a contender down the road. The Browns traded back in the draft twice, getting draft picks and resisting the temptation to reach for players like they did in the past. They got WR Corey Coleman in the first round and have a new QB in Robert Griffin lll. Hue Jackson is a great QB coach so he can develop Griffin into the player he was once as a rookie. The Browns have some talent now, with RBs Isaiah Crowell and Duke Johnson as well as LT Joe Thomas and CB Joe Haden. The biggest problem for the Browns has been poor coaching a QB play, but everything I have seen so far from Hue Jackson suggests this will no longer be an issue. The Browns will not improve much in the wins column, but they will take strides to compete down the road. Pittsburgh Steelers: The Steelers finished second in the division with a 10-6 record, which is a testament to how resilient this team is. QB Ben Roethlisberger threw for 3,938 yards and 21 TDs, but also threw 16 INTs. With all the weapons at his disposal in Antonio Brown, Martavis Bryant and a workhorse RB in Le’Veon Bell, there is no reason for a veteran super bowl champion QB to throw that many INTs. Bell was hurt for a lot of last year, and so was Roethlisberger but RB DeAngelo Williams and QB Mike Vick stepped up produced. The Steelers won 10 games with key injuries and a lot of turnovers, not to mention the leagues 30th ranked pass defense. They drafted CB Artie Burns in the first round but he does not really fit the scheme. He is a better zone CB and can break on the ball but the Steelers run a lot of man coverage. It will be interesting to see how Burns helps the secondary in 2016. The Steelers are one of the most talented teams in the NFL, but their defense must improve and they must stay healthy if they want to make a deep playoff run which they are capable of doing in 2016. Cincinnati Bengals: The Bengals were one of the best teams in the NFL last year, but playoff demons continue to haunt this team. The Bengals had the Wild Card game wrapped up and won, but Vontaze Burfict had two crucial 15 yard penalties in the final minutes which set up the Steelers game winning field goal. That game sums up the Bengals, they are extremely talented a can win games but when it matters most in crunch time, they make mental mistakes and lose by shooting themselves in the foot. This is a risk you take when you have players with character concerns like Vontaze Burfict and Adam Jones. The Bengals were in the top 15 for both passing and rushing, which means they are balanced offensively and they use that to their advantage with play action passes to A.J. Green. They also went out and drafted WR Tyler Boyd, who is a big physical WR who can cause problems for defenses on third down. They also drafted a playmaker in William Jackson III who can instantly help improve the 20th ranked pass defense. Jackson is a ball hawk and will create turnovers to give Andy Dalton and company short fields. The Bengals can get it done in the regular season, but they must prove they can win playoff games. Detroit Lions: The Lions lost a huge piece of their recent success when star WR Calvin Johnson announced his retirement. Matthew Stafford will have to find ways to move the ball without Johnson. Stafford threw for 4,262 yards and 32 TDs but also had 13 INTs. Young receivers must step up if they want to score points against QBs Aaron Rodgers and Teddy Bridgewater and their offenses. The defense must also step up and improve as they were 18th in total defense last year and 19th in rushing defense, that is not a formula for success against RBs Eddie Lacy and Adrian Peterson. They drafted Ohio State OT Taylor Decker in the first round to help protect Stafford, but they must also address the receivers and run defense if they want to compete in this very competitive division. Chicago Bears: The Bears can never seem to have success on both sides of the ball at the same time. Under Lovie Smith their defense was one of the best every year, but their offense was lacking and it cost them a Super Bowl in 2006. Marc Trestman improved the offense but the defense was awful, so they brought in John Fox. Fox has brought balance but must see improvement from QB Jay Cutler who threw for over 3,600 yards but also had a mere 21 TDs to 11 INTs. They lost versatile RB Matt Forte in free agency but will have one of the best young WR duos in Alshon Jeffery and Kevin White, a former first round pick. The passing defense ranked 4th in the league last year, but they ranked 22nd in rush defense. They must sure up that front 7 to stop the great RBs in that division. They drafted OLB Leonard Floyd to help improve both the pass rush and their ability to stop the run. The Bears season depends on how much Jay Cutler and the defense improve, the talent is there for a playoff run. Green Bay Packers: The Packers were one of the most peculiar teams last year. QB Aaron Rodgers lost WR Jordy Nelson for the season and it affected their offense more than people initially believed it would. Nelson was the true #1, which allowed Randall Cobb to play in the slot creating mismatches. Rodgers had a “down year” but still managed to throw for 3,821 yards, 31 TDs and only 8 INTs, which quite frankly shows that Rodgers is still great in down years. The offense was, however, inconsistent and went three and out a lot. RB Eddie Lacy seemed nonexistent down the stretch but has said he has gotten back into shape. The defense is much like the Bears in that they were great in the secondary, but were bad against the run as they ranked 6th and 21st. WR Jordy Nelson will be back healthy which will open up the offense a lot more, and with a QB in Aaron Rodgers, the Packers are always a deep playoff run contender. Minnesota Vikings: The Vikings are the reigning NFC North champions, and they have improved this off-season. They ranked 29th in total offense and 31st in passing offense last year, so they went and drafted the best WR in the draft in my opinion in Laquon Treadwell. This will help QB Teddy Bridgewater develop and improve from his 3,231 yards with just 14 TDs and 9 INTs a year ago. Treadwell, along with versatile playmaker Stefon Diggs, will take the pressure off star RB Adrian Peterson to carry the load of the offense. The defense ranked 13th in total defense and 12th in pass defense, but went out and drafted CB Mackensie Alexander from Clemson. Alexander is a great all-around CB, but to me he excels in zone coverage and making plays on the ball, which will be critical against the QBs in this division. The Vikings won the division with a weak offense, but they went out and got a lot better on that side of the ball so they should compete in the NFC North this year as well. Last season, the New England Patriots won the AFC East with a 12-4 record and were the only team to clinch a playoff berth from that division. The New York Jets and Buffalo Bills showed much improvement but both teams barely missed the playoffs a year ago. The Miami Dolphins finished with a 6-10 record but there is room for optimism with a new head coach in Adam Gase and a young but talented roster. New England Patriots: It is crazy how the whole first part of the schedule can change so drastically in one day. Tom Brady’s appealed 4 game suspension has been reinstated by a federal appeals court. This means they will be without Brady when they travel to Arizona and Houston and play division rivals the Dolphins and Bills at home. They could win some of those games but it would not be a surprise if they lost at least one of the divisional games without Brady. They still have the best TE in the game in Rob Gronkowski and a solid slot WR who can split out wide in Julian Edelman. Last year they ranked 10th in total defense but lost versatile OLB and pass rusher Chandler Jones who is now in Arizona. One thing about the Patriots over the years is whenever they lose stars they never seem to lose a step, as more guys step up to replace the production. Expect the same this year, they might also want to draft a pass rusher as this draft is loaded with them. They might drop a few games early on without Brady, but this team will definitely be one of the best teams in the AFC in 2016. Miami Dolphins: Miami is coming off a disappointing 6-10 season, and has a new head coach in Adam Gase. A new coach always means a new culture and early optimism, especially because the Dolphins have a talented QB in Ryan Tannehill who threw for 4,208 yards with 24 TDs and 12 INTs. They have an emerging superstar WR in Jarvis Landry who caught 110 passes for 1,157 yards. They also have a 2nd year WR receiver DeVante Parker who was their first round draft pick in the 2015 draft. They need to get him more involved in the offense as he only had 26 catches last year. They lost RB Lamar Miller and must have someone step up to replace him, perhaps that will be Jay Ajayi who showed flashes last year but must stay healthy. Defensively the Dolphins were 25th in total defense and 21st against the pass. They also lost star CB Brent Grimes in free agency and should invest in the defense in the 2016 draft. The Dolphins have talent offensively but just need to put it together so they can be competitive in the division. New York Jets: The Jets were supposed to be a cellar dweller last year, but all they did was win 10 games and nearly made the playoffs. They did this with much improved QB play by first year starter Ryan Fitzpatrick, who threw for 3,905 yards with 31 TDs and 15 INTs. The Jets seem undecided about his future, as they have not yet resigned him with rumors about drafting QB Paxton Lynch in the first round. The Jets should stick with Fitzpatrick and try to address other needs, a rookie QB would set back their success too far. On offense they have talent around Fitzpatrick, with star WR Brandon Marshall (109 receptions for 1,502 yards and 14 TDs) and Eric Decker who is a good complement to Marshall. They also signed versatile RB Matt Forte this offseason who is a solid receiver out of the backfield and a have a RB with game changing speed in Dri Archer. The Jets were in the top five for both total defense and rushing defense, if there is an area that they should address it is in the backend as they ranked 13th. This draft class is deep with talented CBs and they could maybe take Eli Apple or William Jackson to help improve the secondary. The Jets have lots of talent to compete for the division, it all just depends on whether or not they feel Ryan Fitzpatrick is their QB or not. Buffalo Bills: The Bills had arguably the breakout player of the year in QB Tyrod Taylor. Many felt he could not beat out E.J. Manual or Matt Cassel for the starting job during training camp. All he did was win the job and throw for 3,035 yards, 20 TDs and 5 INTs while also running for 568 yards and 4 TDs. Taylor led them to an 8-8 record and nearly got them a playoff berth. He seemed to find instant chemistry with superstar WR Sammy Watkins who caught 60 passes for 1,047 yards and 9 TDs while missing 3 games due to injury. RB LeSean McCoy missed 4 games but still managed to rush for 895 yards. Karlos Williams also showed promise when McCoy was out. The Bills defense was supposed to be a strength heading into the season, but turned out to be a major liability. They finished 19th in total defense, 16th in rush defense and 19th against the pass. Rex Ryan has always been known for his great, physically imposing defenses and if the Bills want to make the playoffs they must get back to that style of defense. They might want to address the defensive line in the draft as they lost DE Mario Williams. The Bills would be smart to take Jarran Reed in the first round because he is a space- eater inside a great run defender. In order for the Bills to make the playoffs, they must keep their key players healthy. Tyrod Taylor, Sammy Watkins and LeSean McCoy all missed games last year and they must also improve an uncharacteristically bad Rex Ryan defense. Bottom Line: The AFC East will not have to deal with Tom Brady for the first 4 weeks, but the Patriots will once again be extremely competitive when he returns. The Jets must figure out their QB situation but have the talent to compete for the division. The Bills must stay healthy and get better defensively and the Dolphins must buy in to a new coach and culture to have any chance at competing. Right now, the Patriots still look like the best team in this division but the Bills and Jets are closing in on the reigning division champions. Last season, the Washington Redskins won a very weak division in the NFC East. They won their last 4 games including 3 on the road to finish at 9-7. The NFL Draft has not even taken place yet, but nonetheless it is never too early to make football predictions. Washington Redskins: They put the franchise tag on QB Kirk Cousins so they have their QB for at least the 2016 season. Cousins played extremely well down the stretch and finished the season with 4,166 yards, 29 TDs and 11 INTs. The Redskins should be good on offense as they return WR DeSean Jackson, WR Pierre Garcon and TE Jordan Reed as well as RB Matt Jones with Alfred Morris now in Dallas. The Redskins schedule is very tough as they open the season against Pittsburgh. They must also travel to Baltimore, Cincinnati, Arizona and Chicago and have home games with Carolina and Green Bay. The Redskins secondary is getting older and should be addressed in the draft. Perhaps they will get a CB or FS in Mackensie Alexander or Karl Joseph.The Redskins probably will not take a step back and should compete for the division title despite a brutal schedule. Dallas Cowboys: The Cowboys were plagued with injuries a year ago. Dez Bryant was never fully healthy until the back half of the season. Tony Romo broke his collarbone against the Philadelphia Eagles. The Cowboys lost 7 straight games in his absence and finally won again in his return over the Miami Dolphins. He was reinjured against the Panthers and had to sit out the remainder of the season. The Cowboys finished 4-12 in 2015. If they can stay healthy, Romo and Bryant are one of the most explosive duos in the NFL. They also have other weapons in Terrence Williams and a terrific slot receiver in Cole Beasley. The OL is one of the best in the game and should provide running lanes for Darren McFadden and Alfred Morris. The Cowboys would like to apply more pressure on the QB so they might draft a DE such as Joey Bosa. If the stars can stay healthy, the Cowboys would be the frontrunner to win the division. New York Giants: The Giants finished the season 6-10, mostly in part to their horrendous defense. They finished 24th in the league in rushing defense and dead last in pass defense. The Giants, led by perhaps the most undervalued QB in Eli Manning, particularly last year, had 4th quarter leads in 10 games and would lose 5 of them. Manning was brilliant with 4,432 yards and 35 TDs with just 14 INTs. He was the reason the Giants were in position to win so many games, only to have the defense blow it late. The team has spent a lot in free agency to improve the defense as they added DE Olivier Vernon, DT Damon Harrison and CB Janoris Jenkins. They will absolutely need to address the defense in the draft, especially the secondary so they might get CB Vernon Hargreaves III. The Giants will be able to compete offensively with anyone, especially with a favorable schedule except for road games at Green Bay and Pittsburgh as well as finishing off the season at Philadelphia and Washington. The defense must improve significantly in order for the Giants to win the division. Philadelphia Eagles: The Chip Kelly era is officially over, and Doug Pederson is now the head man in Philly. Kelly tried to make a statement by showing that his up-tempo spread offense could work no matter who was on the field and because of this the Eagles are without DeSean Jackson, Jeremy Maclin, LeSean McCoy as well as DeMarco Murray. The Chip Kelly experiment has left the cabinet very bare in Philadelphia but they have some young pieces to build around in WRs Jordan Matthews and Nelson Agholor for QB Sam Bradford. Bradford must stay healthy and improve in 2016 as he threw 19 TDs with 14 INTs last year. The defense finished 32nd in rush defense allowing an average of 4.5 yards a carry. The pass defense was not much better, finishing 28th in the league. The Eagles schedule is difficult with road games at Chicago, Seattle, back to back on the road against divisional rivals Dallas and New York. They do get three of their final 4 games at home. The Eagles have a lot of rebuilding to do on both sides of the ball and should maybe look to sure up their run defense by drafting thumping LB Reggie Ragland. It will be a rebuilding year in Philadelphia and the record will reflect that. 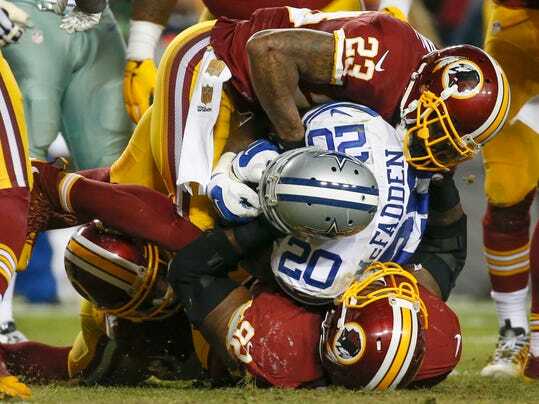 Bottom Line: The two teams who should look to really compete for the division crown are the Cowboys and the Redskins. The Cowboys when healthy can be one of the most explosive offenses in the NFL and the Redskins are very good all around. The Giants must sure up their atrocious defense and the Eagles have too much rebuilding and regrouping to accomplish to really compete this year, but this is the NFC East so anything can happen.